The winter has come and brought a lot of snow and ice. The intense snow combined with low temperatures and wind often are the reasons for bad road conditions. Except the mandatory winter equipment which includes ice scrapper, winter tires, snow chains, antifreeze, winter wrapper liquid, lock defrost liquid and others, it is good to have water, folding snow shovel, blanket and full tank of fuel and additional fuel tube with fuel. The windshield wipers must be at good condition and work good. You must put winter tires on all wheels to avoid the danger of slipping. Always start driving only after you have cleaned the car from the snow and ice. This is extremely important as even the smallest thing could cause problems to the visibility and distraction which could bring troubles. Do not drive fast! 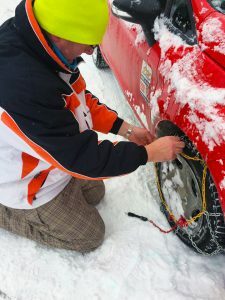 In case of snow and ice on the road, the grip between the tires and the asphalt is smaller which makes the car unstable especially in the turns. Reduce the usage of the break pedal, if you want to decrease the speed use the transmission instead. Do not push down sharply the gas and break pedals, and do not turn the steering wheel sharply as it is very dangerous. Always keep distance between the car in front of you that will help you to react better in case of any immediate circumstances.